The tall palm trees are swaying gently in the breeze. You feel the delightful ocean breeze and the warm California sun on your skin. You’ve made it to your vacation at Mission Beachfront Oasis 2 in South Mission Beach. 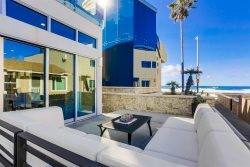 Stretching out over 2 floors with 4 bedrooms, 3 bathrooms and plenty of living space both inside and out, this rental property is perfect for your dream vacation in San Diego. On the front beach level is the ultimate master suite complete with a king bed and living area with a queen sleeper sofa for additional accommodations. It’s an ideal space for either a couple searching for added privacy or a young family. In addition, the en suite bathroom features marble counters, radiant heating in the stone floors, a steam shower and a luxurious claw-foot soaking tub to enjoy a few precious moments alone. With sliding glass doors bringing the outside in and a gated, furnished patio with sandy beach, you can enjoy the cool ocean breeze from inside or out. Upstairs, the entire great room area has a bird’s-eye view of the channel that flows from Mission Bay to the ocean. The spacious patio with a BBQ grill and seating is a lovely spot to take in the glorious sunset, perhaps with a glass of wine in hand. A spacious living room boasts hardwood floors, tract lighting and a cozy fireplace for a serene and welcoming environment. A beautiful stained-glass window depicts a coastal scene and offers a lively pop of color in this neutral space. A lovely seating group beckons the family to gather for a morning game plan, an after-dinner chat or perhaps a late-evening gabfest. The big-screen HDTV allows you to stay up-to-date with your favorite TV show, a long-awaited sporting event or the latest blockbuster movie. The kitchen offers everything you need to create a culinary masterpieces. Crisp, white cabinets offset the gleaming stainless steel appliances and granite counters and backsplash to create an exciting and sophisticated space. A breakfast bar with swivel chairs seats 4 and the adjacent dining table seats 4. Down the hallway, a guest bedroom with a king bed features plush carpeting and a cozy seating area. The 3rd bedroom features a queen bed and flat-screen TV. These 2 rooms share a beautiful hall bathroom with a double vanity and generously-sized tub shower. The 2nd king master suite offers a cool tile floor, small bay window and a seating area. The en suite bathroom is a luxurious treat with dual vanities, a deep soaking tub and oversized shower with Travertine tile. At your Mission Beach vacation home, you are just steps from South Mission Beach park and its many activities, including beach volleyball, basketball courts and a surf-break at the jetty. Just a short walk away is the playground at the Mission Bay side, where the calm waters are perfect for kayaking and stand-up paddleboarding. Nearby are plenty of wonderful restaurants, shopping boutiques and coffee shops. The boardwalk is a convenient walking distance, but you are far enough away not to be disturbed by the noise and exuberance of the crowds. For a family day of fun and adventure, visit nearby Belmont Amusement Park or Sea World. This little piece of paradise awaits you and your family in sunny San Diego. Get here as soon as you can! The location and view wereamazing. To be able to walk on the beach at any moment was fantastic. The home was well maintained and very inviting. We had a great experience.